Just because you don't campaign across the country, doesn't mean you can can't be competitive in your local beer can series. Quantum's Karl Felger talks about his experience managing beer can series and his tips for being successful. My first experience with “beer can racing” was when I took over the boat and team management of Surfrider, a Frers 46 owned by the Ruhlman family in Cleveland, OH. I’d just finished my sophomore year in college, and up until that point in my life the majority of my experience was sailing on smaller dinghies such as Thistles, Highlanders, Lasers, 420’s, etc. A 40+ foot keelboat is a completely different animal, but being introduced to the boat during these Wednesday evening races was both educational and fun. Beer can racing is a great way to allow sailors of all skill levels a chance to experience yacht racing in a competitive yet fun environment, but that doesn’t mean you can’t be competitive and run a successful campaign. I’ve now managed numerous club regatta campaigns over the years and here are a few tips and tricks that sailors of all levels can use to manage a successful beer can racing team and make the most of their campaign. Putting together a season long schedule takes time and effort, but it’s important to set expectations as early as possible as summers fill up fast and it’s stressful for crew and owner alike to not know what’s going on. Even if some events later in the season are still in the planning stages, getting them on the radar and gauging interest is key. There are a few options out there for managing this online, two popular (and free!) ones are Doodle (a scheduling tool that makes it easy for team members to show their availabity and comment to the group) and Google Sheets (another free service that behaves a lot like an Excel spreadsheet, but allows group editing in the cloud). Pro tip - It’s also a good idea to use these times to discuss the season’s shore crew responsibilities. Click here for a great article about how to build a great shore crew. Creating a sense of team and camaraderie among the crew will go a long way towards having a successful and enjoyable season. Team gear emblazoned with the boat/team name is a great way to build a strong bond. Having a steady crew participating each week is important, but don’t forget that beer can racing is also a great way to introduce new people to sailing, such as coworkers, friends and family. If you’re struggling to find crew, talk to other boat owners, your local yacht club and/or junior race team to find people eager to participate. Participation isn’t just limited to the boat — don’t forget to invite your spouse, kids and whoever else wants to join the after-race socialization at the yacht club. Most beer can racers show up to the dock after a long day at the office. Make sure to breathe, turn up the music and relax. These races are about having fun, socializing and introducing people to new experiences. Yelling and ill-tempers should be kept to a minimum, if not completely banned from these races. Take this time to try team members in different positions on board, so everyone gets a better understanding of each other’s jobs…except the owner, who, in my experience, should never be allowed in front of the mast, or bad things happen. 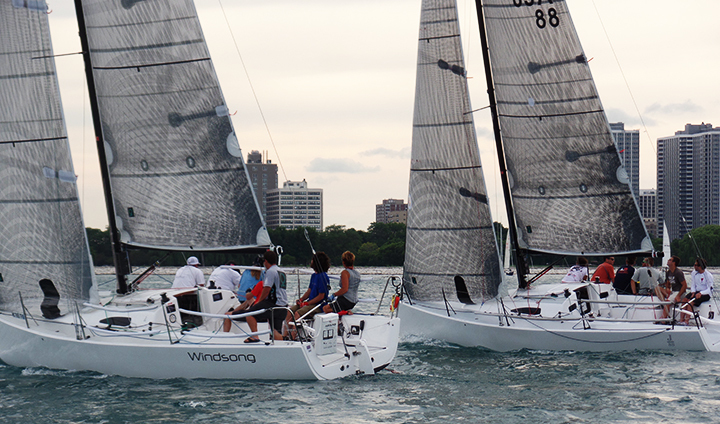 While these races may not be as highly competitive as a championship regatta, they can still be rewarding for both the owner and team. Take some time to think about the strengths and weaknesses of the entire team and set goals that are realistic and meaningful to the team. Feel free to have some fun with these goals as well, with a mix between goals that are based on results, participation and humor. So, back to that first night on Surfrider. Being new to the boat and team, I was able to talk briefly with the owner, some team members and a former caretaker of the boat to get a general sense of what the team’s expectations were for the season. Ultimately, they were a high-performance racing team that enjoyed the opportunity to sail together and with friends/family in a more relaxed setting each week. We went out that evening with the simple goal to have fun, drink beer and enjoy a beautiful evening on Lake Erie. I don’t remember how we ended up on the score sheet, but I do remember we had a great time, I made some lifelong friends and Wednesday evenings have become one of my favorite nights of the week.